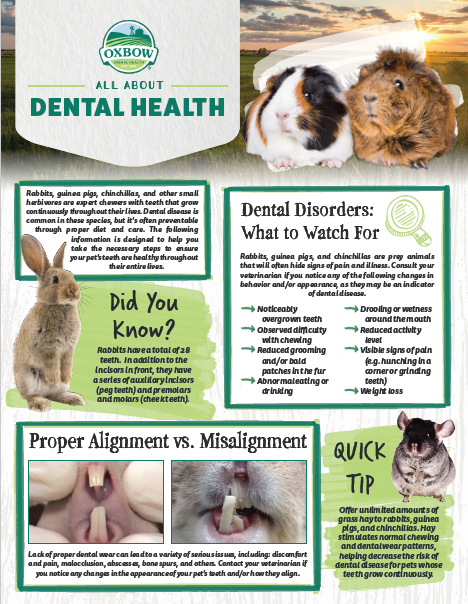 Rabbits, guinea pigs, chinchillas, and other small herbivores are expert chewers with teeth that grow continuously throughout their lives. Dental disease is common in these species, but it’s often preventable through proper diet and care. The following information is designed to help you take the necessary steps to ensure your pet's teeth are healthy throughout their entire lives. Rabbits, guinea pigs, and chinchillas are prey animals that will often hide signs of pain and illness. Consult your veterinarian if you notice any of the following changes in behavior and/or appearance, as they may be an indicator of dental disease. Offer unlimited amounts of grass hay to your rabbit, guinea pig, or chinchilla. Hay stimulates normal chewing and dental wear patterns, helping decrease the risk of dental disease.